The most difficult thing about following a workout program is deciding when exactly to change it. You’ve always got two voices in your head—the one telling you to stay the course and give your workouts time to work, and the other one tempting you to scrap the routine you’re doing altogether and try something new to “shock” your body. Of course, listening to one influence or the other can lead to disappointing results, but you can’t listen to both, either. Let me show you how to make one program last indefinitely by making slight changes over time that both keep things interesting and allow continued gains. Let’s use the following workout as an example. It’s a shoulder routine with an emphasis on strength, so you not only build bigger shoulders but a stronger overhead press, too. The dip and pushdown at the end work the triceps, which assist the shoulders on presses. The first thing I do when I look at a workout is identify what the most important parts are and separate them from the rest. 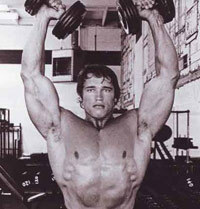 Obviously, if the goal is bigger shoulders and a stronger press, the overhead press is the most important exercise. It’s the first thing on the list and there’s plenty of volume assigned to it. This is where most of your gains are going to come from. The dip and the lateral raise are pretty much just add-ons and, while useful, aren’t going to make or break my progress. If I’m running short on time, can I skip them and still get a great workout? You bet. But I really want to make sure I hit the overhead and Arnold press hard. I’d follow the workout as written the first time out, just to get a feel for it. But by Week 2, I might begin making some very small changes. Note that it’s important not to change things just because you’re bored (and after just one week, NO ONE should be bored). The main reason you should make changes to a program is so that you can perform it for longer and milk more gains out of it. Your body adapts to rep ranges more quickly than any other variable, so I would play around with the reps a bit. 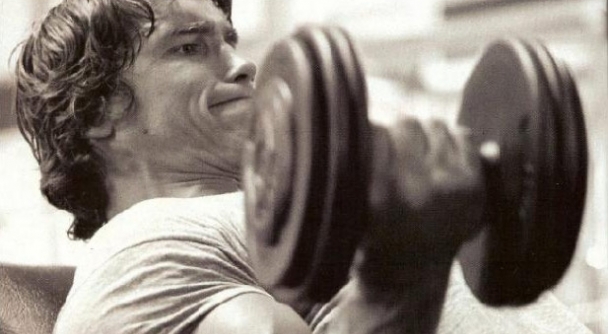 If you hit 10 reps for all three sets on the Arnold press in Week 1, keep the same load and go for 11 reps in Week 2. You may only be able to get 11 reps in the first set and decide to stick with 10 reps for the remaining two sets. That’s fine; it’s still progress. If you chose an appropriate amount of weight in Week 1, you shouldn’t be able to get more than 12 reps a week later, and I wouldn’t go higher than that—you want gradual progression without peaking too soon. Ten reps and 12 reps affect the body similarly, so even though you’ve changed the workout a bit, you’re still working the muscles toward the same goal—you’ve just increased your work capacity so that you’re now doing more reps with the same weight. You can increase the reps on several of the exercises. However, this isn’t mandatory. Some lifts, like the overhead press, work better if you stick with the reps assigned to them for longer. The form on overhead presses tends to break down quickly, so sets of five are great for working with heavy weight and getting some volume in, but five reps isn’t so many that you get sloppy. Also, since the goal is strength, it doesn’t make much sense to push your reps too high, or you train a different quality than the one your program is intended for. In Week 2, I’d probably increase the weight by two-and-a-half to five pounds on the sets of five, or keep the same load as the prior week and shoot for six reps but no more. By the third week, you have the option of increasing the reps again or upping the weight. What started as sets of 10 might now be sets of 12–15, but I wouldn’t go any higher than 15 or you’ll find yourself training more for endurance. If you add weight, be conservative, and make sure you don’t cut yourself off at fewer than the number of reps prescribed. You added a rep to the first set of five and then increased the weight on the last two sets. After a few workouts, you’ll notice that some exercises are coming along better than others. Your overhead press and dip keep progressing smoothly, but you don’t feel you can add any reps to the upright rows or any more weight to the lateral raises. Now you can get more creative with how you perform the exercises. Try adding weight to the upright rows and then performing the lateral raises with a two-second hold at the top of each rep. This will force you to back the weight off on the lateral raises, but that’s OK; you’ll work your way back up using this harder variation. Another reason to change your training is to customize it based on goals and individual weaknesses or injuries. If, after a few weeks, you feel like your shoulders or elbows are getting sore from all the heavy pressing, or your delts just aren’t growing, try flipping the order and do the Arnold press first. This may fatigue you enough that your overhead press suffers later, but you’ll adapt within a few weeks. 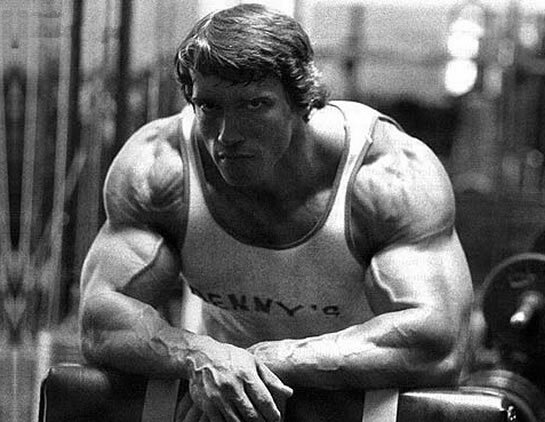 Doing the Arnold press first will warm your upper body up thoroughly so that you can perform the barbell overhead press more safely, and the pre-exhaustion effect will make your delts work harder to hit all your reps.
Let’s say your chest is a big weak point and you want to add some more work for your pecs to this shoulder day. In that case, you could perform dumbbell bench presses first, then do the overhead press, and then DROP the Arnold press. This is important. Whenever you add an exercise, you need to take another one out. The dumbbell bench press may be for your pecs, but it still works your shoulders and triceps, and three sets of it on top of Arnold pressing and everything else you’re doing—both in this workout and whatever you’ve got lined up on chest day—is risking overkill. If your pecs are the priority, your shoulders aren’t, so make the necessary adjustments. Another switch you can make is to the main lift. If you have access to different kinds of equipment, why not switch up the implement you use to press with? Pressing with a log or axel will attack your shoulders in different ways, correcting weak points in your press and stimulating new muscle gains. You could also opt for a seated press or an incline press, which, again, would integrate your pecs into the workout. Pick three or four of these lifts and cycle them weekly—hit each one in turn. Eventually, you’ll want to test your strength, so you can do away with the first two sets of 10 and 8, as these will only fatigue you. Perform a few low-rep sets (3 to 5) until you get to a weight you think you can break your 5-rep record with. Or test your 3- or 1-rep max. Build the workout around testing your strength, and let that inform your program going forward. Here’s another evolution of this workout, for a guy who has identified his chest as a weak point. Don’t forget about rest periods, either. You can boost your conditioning and increase the fat-burning effect of your workout by shaving a few seconds off your rest periods each week. Just make sure you don’t cut too much too soon, or you’ll hurt your ability to perform your lifts intensely. For instance, since the upright row and lateral raise are already superset (no rest), you should allow a good amount of time to recover before repeating them (perhaps two minutes). If you cut the rest down and jump back into the upright row again too soon, you may find you can’t complete all your reps. In short, progressing a workout is more about creativity than exact science. By making tiny tweaks, you preserve the integrity of the program while giving yourself room to increase the challenge and learn how your body responds to different stimuli. If you do it right, you can avoid plateau, injury, and boredom. When you learn to program workouts for yourself, you stop hopping from one set of workouts to another and make one routine do the work of dozens. Sean Hyson is the training director for Men’s Fitness and Muscle&Fitness magazines, and the author of 101 Best Workouts Of All Time (also known as The Men’s Fitness Exercise Bible).